Generalleutnant Adolf 'Dolfo' Galland World War II German fighter ace and commander of Germany's fighter force from 1941-1945. Adolf Galland was a German Luftwaffe General, he flew in the Battle of France and the Battle of Britain. 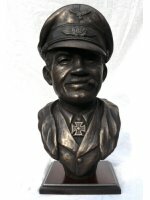 By November 1941 his aerial victories stood at 96 which earened him the Knight's Cross of the Iron Cross with Oak Leaves and Swords and Diamonds one of only 27 recipients of the highest German Decoration. 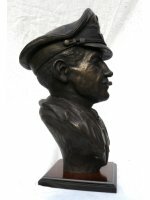 "I knew Adolf Galland extremely well, he was not only and outstanding fighter pilot but a great example and leader of his men. 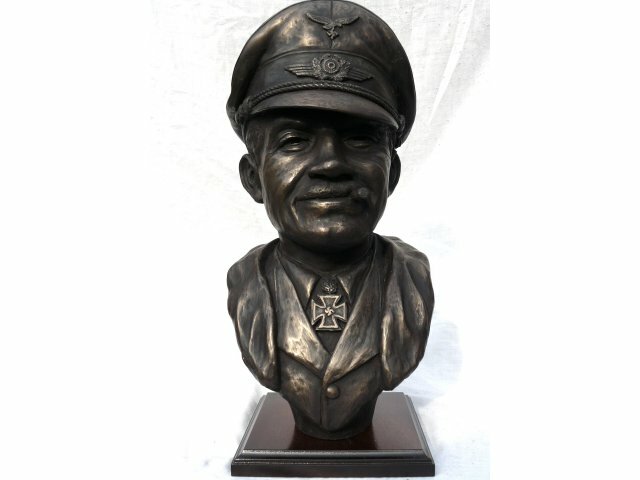 Looking at this new bronze, the resemblance is remarkable, it is very good indeed"
Generalleutnant Günther Rall of JG52, third highest Ace in history. 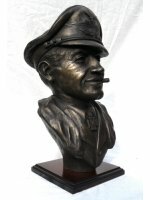 This cold cast Bronze Adolf Galland Bust is made entirely by hand by sculptor Peter Close in his studio in Somerset. 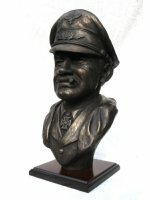 Each limited edition Adolf Galland sculpture is hand engraved by Peter with its own unique edition number and will come to you with a signed certificate of authenticity.